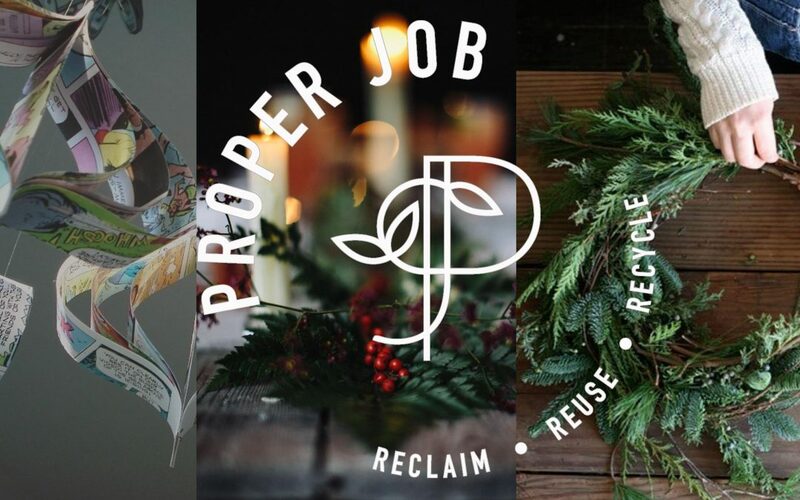 Kick off the festive season by joining Proper Job for a wreath and up-cycled decoration making workshop on Saturday 1st December in Endecott House, Chagford. Enjoy an afternoon learning to make traditional, beautiful wreaths and creative seasonal decorations, up-cycled from a variety of materials from the Proper Job Resource Centre. Christmas may be the most wonderful time of the year but it is unfortunately also the most wasteful time of the year; with the average household throwing away an extra 5 bags of waste. Who needs to invest in more plastic decorations, which will inevitably end up in landfill in a few years’ time? Save your budget and the environment and create some unique and beautiful festive adornments for your home. The workshop runs from 2pm until 5pm and costs £5 + booking fee. It is suitable for all ages and no experience is necessary, however children under 10 must be accompanied by an adult.